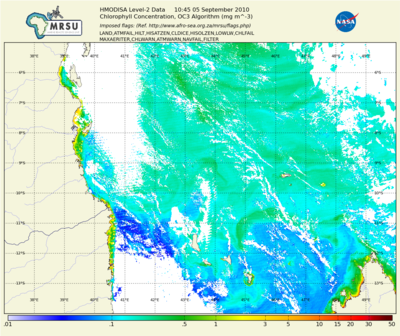 MODIS Aqua SST and Ocean Colour products. Daily at 1 km resolution, OC3v6 default products: Chlorophyll-A, Kd490, fluorescence line height. Regional data available for Angola, Ivory Coast, South Africa (East), Guinea, Namibia, Somalia (North), Senegal, South Africa (South), Tanzania or South Africa (West). An AMESD / SADC-THEMA product. Map of current Air Temperature compared with the Long Term Average, Maximum and Minimum values for assessment and detection of possible anomalies (oC). The input is from ground point measurements which are intepolated to 1 km*1 km grid. An AMESD / SADC-THEMA product. Ten Day temperature map from ground measurements interpolated to create a 1x1 km grid in Geographic Lat/Long projection. Standardised Difference Vegetation Index - NDVI compared to the long-term Standard Deviation. An AMESD / SADC-THEMA product.